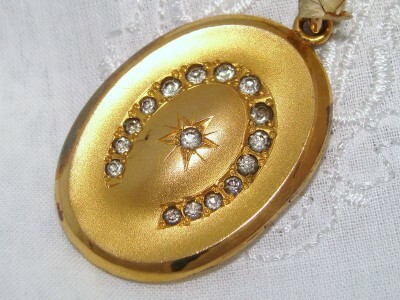 What a pleasure to offer this Rare Genuine Antique Locket complete with the original maker’s swing tag stamped with information relating to the trademark, Veribest Gold Star (with S.B.&L. Co logo) Guaranteed “None Better Made”. It is simply Divine and features a symbolic horseshoe enveloping a “star” at the centre, each encrusted with clear and sparkling paste stones. The back is plain and smooth and inside houses both frames and a clear cover. The hinge and clasp mechanism are in perfect, secure working order. It has the silky smooth feel usually only associated with solid carat gold and expected of quality antique jewellery. MINT Antique condition! What a rarity – an Antique Heirloom Quality complete with original tag as proof it has never been used. With no flaws, it is sure to take pride of place in any Antique jewellery collection. You will be thrilled with this purchase ready to enclose pictures of loved ones to wear close to your heart.